I thought waking up in the dark on a Sunday morning and getting on the subway at 6 AM to join Charlie for some birding was a heck of a task, that is, until I found out that Charlie had just flown in from London yesterday, which he had arrived at from Chicago the day before (after birding Chicago first, off course). The day before that he had flown from London to Chicago. That is, in three days Charlie had traveled further than I have all year! And somehow he was wide awake and ready to find some neotropical migrants when we met at a quarter to seven on the Bow Bridge over the lake in Central Park. Unfortunately, the birds were not really cooperating. Sure, we managed to track down a Red-eyed Vireo, Common Grackles, Black-crowned Night-Herons, and other expected birds in the Ramble and on the lake, but we were eager for more, much more, and we would not stop until we found a host of migrants. Our quest led us up the west side of Central Park until we were in the North Woods, still without a migrant flock though we had managed to pick up a couple of American Redstarts, an Ovenbird, and a Magnolia Warbler. I also thought to send a text message to Jory, who I hoped might be near his computer, to give us a head’s up in case something rare was reported on the birding listservs. The Harlem Meer held some Mallards and our first pretty good bird of the day, a migrating female Wilson’s Warbler which kept its distance and kept us guessing as it foraged frenetically through foliage that frequently frustrated our attempts for a fine view. We pieced the identification together one field mark at a time and were happy when we finally figured the bird out. Then, at about 9 AM we hit our first real burst of migrant activity when we found, in rapid succession, a Gray-cheeked Thrush, a Swainson’s Thrush, more American Redstarts, a nicely-plumaged male Northern Parula, a Black-and-white Warbler, and a Black-throated Green Warbler. The Gray-cheeked Thrush, Charlie’s first of the year, gave us the energy to carry on despite the lack of new birds to watch. Rich: There’s a Black-throated Gray Warbler at Tanner Spring. Corey: Shut up! You’re lying. Rich: No, Jory is on the line and I wouldn’t lie about a bird. Corey: Shut up! Stop messing with me. Corey: Where, exactly, is Tanner Spring? I’ll momentarily interrupt the story of Charlie and I hustling down the west side of the park for a little story. 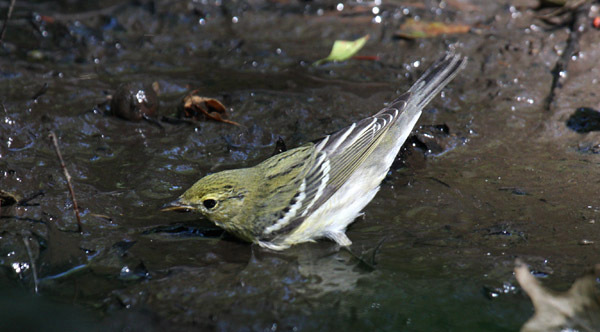 Three Autumns ago, when I had barely begun to bird, a Black-throated Gray Warbler (normally a wood-warbler of the west) was at the Waterhole at Forest Park. Mind you, this was before I had moved to Queens, and Daisy and I still lived upstate. We were in the city visiting her family and I convinced her to go with me to try and find the bird. We failed by arriving five minutes after the bird had left and leaving ten minutes before the bird came back. Though I have since seen one in California I still regret not staying that extra ten minutes that day so I can say I have seen a Black-throated Gray Warbler in New York. So I really, really, really wanted to see this bird. …We arrived at Tanner Spring and joined a horde o’ birders. The bird was not being seen and had not been seen in over 45 minutes. So we waited, entertained by bathing American Robins and House Sparrows, along with the occasional Northern Parula and a Blackpoll Warbler (another new bird for Charlie’s Big Year). And we waited some more. And some more. Then, there, way up there, high in the canopy, was the bird. And when I say high in the canopy I mean immediate warbler-neck inducing high. Skyscrapers were lower than the height at which this Black-throated Gray Warbler was foraging. Nonetheless we did manage to see and identify the bird, no small feat considering there were clouds between our binoculars and the bird. There are some tall trees in Central Park! Though the height the bird was at when we saw it prevented us from getting a good picture the birder who found the bird, David Speiser, got much better looks. Despite our lack of a photographic moment we were satisfied as the Black-throated Gray Warbler was new for both of us for the year. It was neat to see a western rarity in Central Park and weird that the last time Charlie and I birded the park together we had another! After walking a short distance from the birder horde we decided to lay down on the ground for a bit to give our aching backs and necks a rest. We felt we deserved it after birding for five straight hours! 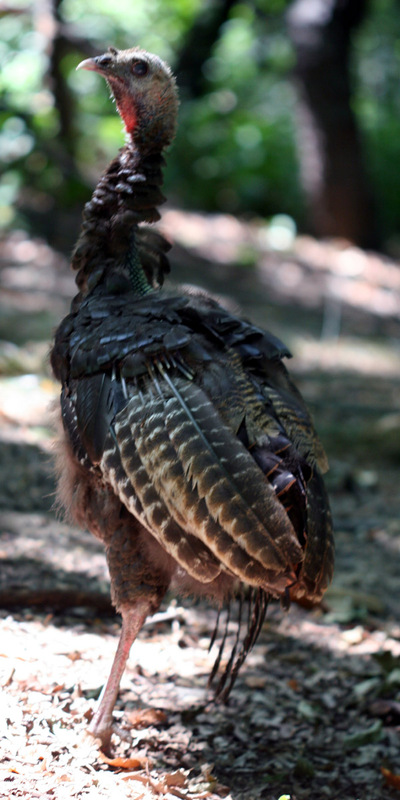 The walk out of the park, me to the subway and Charlie to his hotel, was relatively uneventful, despite our managing to find perhaps the ugliest Wild Turkey ever on our way through the Ramble. Great bird! I heard about it today through Metro Birds. Congrats to both of you! After my honeymoon, I’d love to join you guys any time Charlie is in NY. Some people have all the luck. Jeepers you even hit for $50 on the quick draw coming back from the Muckrace. I had this beautiful post all written about what a slow morning it was at Central Park and yet, how beautiful to see all the flocks of Blue Jays in the Ramble… then I checked the mailing lists this morning. Epic Birding Fail for me. I live in Puerto Rico and fortunately have the opportunity to enjoy some of these birds in winter. When I saw your photo of the Black Throated Green Warbler, which is rare migrant in the high mountains at the center of the island, I immediately recalled when a friend and I searched for the bird last year (following a few birders that saw the bird a few days before). After a two and a half drive to the center of the island and a frustrating day, we spotted the bird for a few seconds up in a steep slope at the edge of a road. Beautiful! But I can’t emphasize how lucky you guys are that you can see all this birds in a walk by the park. By the way, we were birding the same Sunday in PR, this time in the haystack hills in the northern region. The only migrants we spotted were a few Prairie Warblers and a flying-by by Northern Waterthrush. I’ve heard that some Northern Parulas have already arrived. I’ve also seen the Louisiana Waterthrush. And we are still in September! This year it’s going to be great. Thanks, Héctor, for sharing your view of Atlantic migration from Puerto Rico. It’s fun to hear how our common migrants are perceived by the birders who get to spend all winter with them. Be sure to keep us updated on your fall migration! @Will: It was $20. And I must be doing something right! @Carrie: Ouch. Epic fail indeed! @Hector: I can think of a few birds in Puerto Rico I’d like to see! Sounds like a great walk through Central Park! Congrats on finding the Black-throated Gray Warbler. I love this time of year when we get to see some of the migrant birds we normally don’t get. Luckily for me we get the Black-throated out here in Northern California but I would LOVE to see he Black-throated Green Warbler. I might have to take a trip back East I guess! I’m sure you could lead me to a few right? Hello! Just this morning, my mother found this tiny bird on the sidewalk while walking her dog. He is only about 2 1/2″ in length and absolutely beautiful. Luckily, she has a spare bird cage at home and put him inside with some parakeet seed and water. She only intends to keep him until he’s hopping around the cage on his own and he’s already looking better after a couple of hours. My question: what do we feed him? Thanks! Thank you! I have some photos of the bird. I’m not sure now if he’s a black throated green warbler after all, but definetely in that family. Where/how can I post a photo on this site? Feral Cats More Important Than Humans?